We reluctantly leave our B&B in Kerikeri this morning, and drive down the highway to Warkworth. We leave late and arrive early. The Warkworth Country House B&B is ready for us, with the doors open to our rooms, and the beds are made, so we make ourselves at home. As it turns out, Perry Bathgate, the B&B operator is working in the garden, so he doesn’t see us until we have been there for an hour or so. We go to the Bridgehouse Lodge Pub for dinner this evening. It is located on Elizabeth Street, which is the main street in the little town of Warkworth. As it turns out, it is pretty well the only eating establishment that is open in Warkworth this Tuesday evening. The food is good, and the Montieths Original Ale tastes fine. My friend and I take some photographs of the night sky from the front lawn of the B&B this evening, since the sky is relatively clear, and this is a dark rural site. 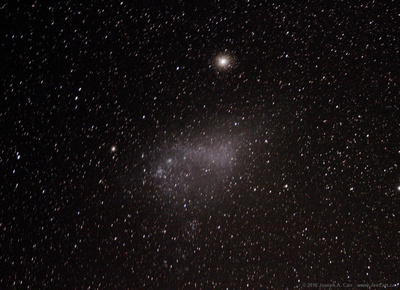 I take photos of the Milky Way, which is a glorious overhead band, as well as the Large and Small Magellanic Clouds, which are sister galaxies to the Milky Way. Despite not using my tracking mount, the photos turn out quite well due to the dark skies in this rural location. Jan and Perry serve us a delicious full English breakfast this morning at the B&B. We decide to go to the farm at SheepWorld, which is only 4km north of Warkworth. We walk around the farm pens to see all the animals: sheep, lambs, pigs, rabbits, Alpaca, cattle and goats. Of course, the highlight is when the dogs herd the sheep from the pasture into the pens; as well as the sheep shearing demonstration, and the finale – we get to feed the lambs milk from bottles. SheepWorld – sheep shearing & sheep dogs from JoeTourist InfoSystems on Vimeo. HINT: Click on the little four segment icon beside the “HD” in the lower right corner of the above video window to view the video in high definition mode. In the late afternoon we drive over to nearby Point Wells to visit with my cousin Cindy and her family. They have a wonderful property located on the estuary, and the layout of their house takes full advantage of outdoor living and the beautiful view.. Before dinner, my cousin’s husband Graeme takes us on a walking tour along the shoreline surrounding the little community of Point Wells. It is a beautiful area, with some fine views all the way to Omaha Beach. The dinner Cindy and Graeme prepare for us is excellent: ceviche and fresh tomatoes, fresh caught fish grilled on the BBQ, lovely plump scallops off the boats at nearby Omaha, a nice salad, and oven roasted potatoes. We have a couple of white wines we brought along – a pinot gris and a chardonnay – which both work well with the meal. Yet more of that wonderful New Zealander hospitality! We are traveling to a B&B on the Coromandel Peninsula today, which means driving through the motorways of Auckland. After we leave the B&B in Warkworth, we do a quick drive to the neighbouring Parry Kauri Park & Warkworth Museum, where there are two very old and extremely large Kauri trees. The drive through Auckland goes very well; traffic is a bit heavy, but it keeps moving nicely. The GPS keeps us on track and helps us to manoeuvre through the maze of motorways, lanes and ramps around and through Auckland on our way around the Hauraki Gulf to Whangamata (fang-a-mata) on the Coromandel Peninsula. This entry was posted in New Zealand and tagged bay, beach, coastline, expressway, farm, fish, food, harbor, harbour, highway, hotel, restaurant, sheep. Bookmark the permalink.